Home>How do I get into the industry? Now you have decided that the Travel and Tourism industry is an industry you would like to join, the next question is how? How do you join the travel and tourism industry? There are many ways to join the industry but before you race off to enrol in a course, look at the various sectors and jobs and narrow your selection to those jobs that appeal to you. Ask as many people as possible friends, family, the local travel agency, teachers and career counsellors what they know about the travel industry; read about the industry in the media; the travel industry media; careers websites – nothing beats researching first. Some jobs in travel require specific level qualifications and these are explained in our Education and training career pathways map. Some roles recognise prior experience or skills gained in other industries e.g. customer service, accounting, I.T., having travelled extensively, an in-depth knowledge of one region of the world. Whatever jobs appeal to you, remember the travel industry offers the opportunity to up skill and move around. Be realistic that it may take time to be the CEO, so look at entry level jobs, but keep your eye on where you want to eventually specialise. You have now completed your training, undertaken research and have a plan – so where are the jobs? Read on to explore the many ways to start your search, read some success stories, or read our CV writing tips. These can be online or in print. For online, visit online job boards such as Seek; MyCareer; Careerone; Adage (mature professionals); Parttimeonline; Careermums; Gumtree - to name a few. For newspapers try the job/employment sections of the major metropolitan papers or community papers. Look in magazines such as TNT or 9 to 5. You will also find the names of the travel recruitment agencies and many travel companies who advertise direct. There are well respected recruitment agencies, that specialise in travel, and are able to match you with employers who are looking for someone like you. Usually, it will be permanent, full or part time at entry level. Temporary or contract employment is normally for people with current travel industry experience and doesn’t offer any training. When you work as a “temp” you are employed by the recruitment agency and placed on assignment with the client. You will find the travel recruitment agencies in the employment section of the yellow pages directory (or online at www.yellowpages.com.au). It is usually free to register with a recruitment agency and they will give you advice on what jobs are available for your qualifications and experience. Travel recruitment agencies are found in major cities and they often have jobs that are not advertised. Career counsellors and teachers are able to advise on the types of roles available and how to apply. At university or training colleges, staff will pass on information about job vacancies which come to their attention. Traineeships are available in some sectors but not all. A traineeship normally involves a commitment to study part time whilst working in the job over a set period. Wages are adjusted to reflect the balance of hours worked vs. studying and normally applies to entry level roles. Internships are usually arranged through the educational institution where you are studying and involve working for a travel company for up to 6 months as part of your degree. Often the company who takes on an intern will offer a permanent role after their study is completed. It’s a great way to decide if you like the hands on aspect of the role and/or the company. If you know the job you want and research which companies have that job, then you can apply direct. It takes more time upfront to find the companies but you are narrowing the field and being selective in your applications. Look at online job boards for companies’ names and websites. Visit a company website and check if this is the type of company you would like to work for. They will often advertise vacancies and describe how to apply. The larger companies have a “work for us” page or “jobs” page. Notice boards at schools, travel colleges and tertiary institutions have jobs posted in common areas. Local companies will post vacancies here. There are regular career expos open to everyone from school leavers, tertiary students, people returning to the work force and mature professionals. Attending these expos can give you valuable insight into the opportunities available. 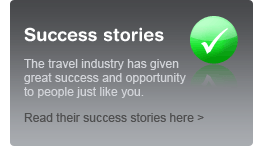 Some travel companies regularly exhibit and promote the travel careers they offer. Often the travel recruitment companies will be at the careers expo promoting what the industry has to offer. You will find out more about each job, what skills are required and your chances of winning that type of role. Visit the Australian Federation of Travel Agents (AFTA) website for more information about travel agents and how to find your local travel agent. Under useful links you will find related Travel Associations and jobs in travel websites. Do you know anyone in the industry? Ask them where they meet and if there is an association or a networking group you can attend. Some are for people already employed in the industry but some allow non members to attend. Subscribe to travel magazines to gain insight into what is happening in the travel industry and check out the job pages. Regular magazines (print) are Travel Weekly and Travel Bulletin. Daily online travel media are Travel Daily, E-TravelBlackboard and Travel Today. You will need to subscribe but ask if they have a student rate. Spread the word amongst friends and friends of your family that you are looking to join the travel industry. Work experience is usually arranged by a school or travel college and involves being placed in a travel company for up to a week. Call at local travel agencies and offer to do work experience. Work experience will give an insight into how the business operates and what skills the job entails. If you make a good impression you may be asked back for further part time work until you finish school or college. Tips: Take along a well prepared resume (no spelling mistakes) and remember the first impressions count, so dress in professional attire.